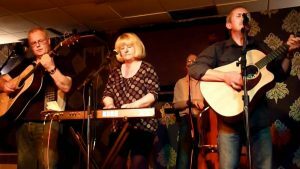 Don't miss this fantastic folk foursome with their stunning arrangements of traditional songs as well as their own compositions - they've been creating a storm on the festival circuit and we're delighted to welcome them to Teesdale! 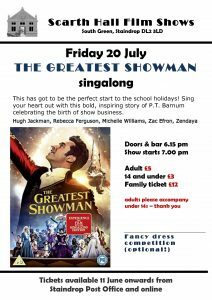 A chance to join in with a few choruses if you fancy. 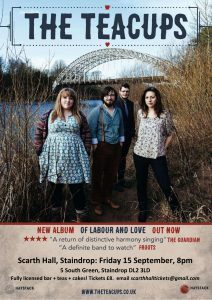 Check out the trailer for their second album "Of Labour and Love". 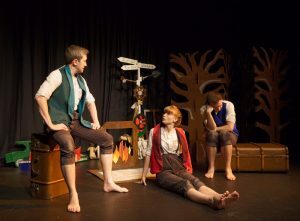 Tickets from Staindrop Post Office or online from TicketSource. 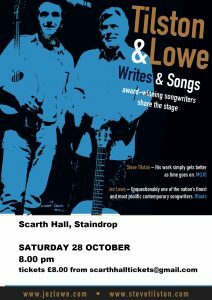 You can also pay on the door but please email scarthhalltickets@gmail.com to reserve. 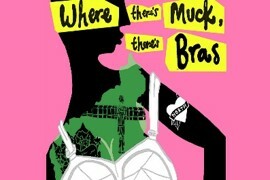 Doors and bar open 7.15 pm. As well as a licensed bar there'll be tea, coffee, and homemade cakes & bakes! Welcome to the 6th Staindrop Beer & Music Festival! 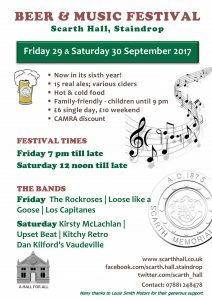 We've a great line-up of bands (see poster), a fantastic range of ales, hot and cold food, and a very warm welcome. Friday evening 7 pm till late, Saturday 12 noon till late. Any aspect of your mobile 'phone, laptop, digital camera, email, internet, online shopping wordprocessing printing etc -- complete beginners welcome! You don't need to own a laptop or tablet - we provide them in the Scarth Hall IT suite. A selection of arts and crafts created by members of Staindrop, Whorlton and The Witham art groups run by local artist Jane Young. Volunteer Wendi runs the Scarth Hall iTeaTime Internet Café which offers free, friendly help with any aspect of your mobile 'phone, laptop, digital camera etc. We can also help to get you started with email, internet, online shopping word processing, printing etc -- complete beginners welcome! You don't need to own or bring a laptop or tablet - we provide them in the Scarth Hall IT suite. Join us for Halloween Family Fun Night at Scarth Hall! There'll be games, face-painting, a fancy dress competition, kids' disco, and more! Two of the UK Acoustic/Folk scene's finest songwriters join forces for a series of concerts filled with songs and music, chat and banter and intimate insights into their approach to their craft. Head to head, neck and neck (guitar necks, that is!) listen in as they rekindle the spontaneity of their late- night living-room song swaps. Questions, answers, anecdotes and anarchy... and a very special evening of music. 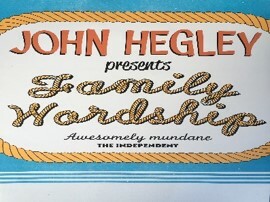 Songwriting partnerships are nothing new in folk music. But when two artists as singular and well-respected as Steve Tilston and Jez Lowe get together to co-write after forty-odd years of ploughing their own distinctive furrows, it is definitely worth sitting up and listening. 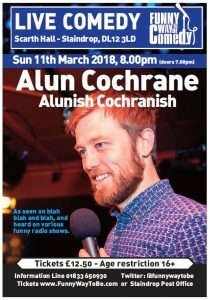 Tickets from Staindrop Post Office or online from TicketSource. Doors & bar 7.00 pm. Any aspect of your mobile 'phone, laptop, digital camera, email, wordprocessing printing etc -- complete beginners welcome! You don't need to own a laptop, we provide them in the Scarth Hall IT suite. 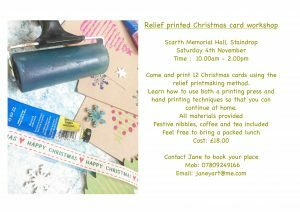 Come and create 12 Christmas cards using the relief printmaking method. Learn how to use both a printing press and hand printing techniques so that you can continue at home. Prolific north-east songwriter John Wrightson is a regular at the Staindrop open mic sessions. Scarth Hall is therefore delighted to welcome the full John Wrightson Band for a special concert with support from World Champion Spoons player Bert Draycott. 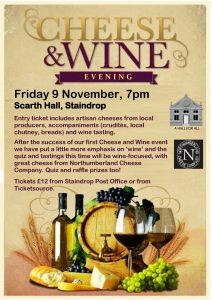 Tickets will be available from Staindrop Post Office and online from October. Volunteer Wendi runs the Scarth Hall iTeaTime Internet Café which offers free, friendly help with any aspect of your mobile 'phone, laptop, digital camera etc. We can also help to get you started with email, internet, online shopping word processing, printing etc -- complete beginners welcome! You don't need to own or bring a laptop or tablet - we provide them in the Scarth Hall IT suite. Join us for an evening of festive music with local choirs no added sugar, carillon, and concordia. Wine, soft drinks, and mince pies available! 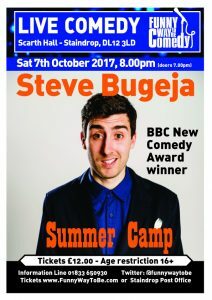 Tickets from Staindrop Post Office or 01833 650034. A spring market showcasing local food producers and crafters.